The most common uses are for a single person sized bedcover, bed throws, substitutes of carpets even used as small bag or eating cloth. These bedspread are hand stitched by local artisan, hence would add great exotic flair to your living space. ANATOLIAN HAND MADE RUNNER/RUG. 100 % NATUREL DYED. SIZE (feet) : 1'6"x9'. AGE : 30-40 YEARS OLD. 277x188cm 9'3"x6'3". An Old Traditional Hand Made Indian Dari. Very Nice Wool Piles Hand Made Indian Dari. But when see the Dari in different light seems to be darker or richer. Style Dari. Origin Indian. OLD TURKISH KAYSERI 'ART SILK' RUG, TREE OF LIFE PRAYER DESIGN, CIRCA 1920. Antique Anatolian Kayseri 'art silk' prayer rug, beautifully drawn with a tree of life and birds. Beautiful rugs using this process have been made since the end of the 19th century. This enables you to buy a rug that looks like silk at a fraction of the price of real silk. Beautiful Persian Isfahan textile block printed by hand with Paisley design with lovely colours. It can be use for bed cover or table cover or wall hanging. It has maker signature in the back.It is in good condition . It measures approx 260cmx 244cm. This is a faithful modern revival of a traditional antique cotton dhurry from Rajasthan, made in Jodhpur. TYPE: hand woven. AGE: modern. SIZE: 2.68m x 1.83 - 8ft.9" x 6ft. THE RUG ATTIC. (002354 - for office use only). Moroccan Boucherouite Runner. 184x75cm 6'2"x2'6". The Boucherouite Rug made from old fabric on cotton foundation by tribes in Morocco. Style Tribal Boucherouite. MoroccanBoucherouite Runner. The Rug is not perfectly rectangular or evenly straight due to being handmade. This is a faithful modern revival of a traditional antique cotton dhurry from Rajasthan, made in Jodhpur. TYPE: hand woven. AGE: modern. SIZE: 3.02 x 2.46 - 9ft.10" x 8ft. THE RUG ATTIC. 307x239cm 10'2"x8'. Indian Dari. 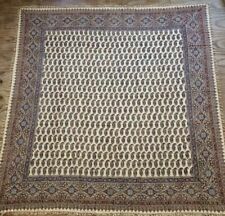 Very Nice Cotton Hand weave Indian Dari. The Dari is not perfectly rectangular or evenly straight due to being handmade. Pile or Weave Cotton. An Old Traditional Hand Made. Recently cleaned, so in good order. Should be viewed. A finely woven pure silk Kashmir runner, with an intricate pattern. TYPE: handknotted, silk pile with cotton warp & weft. AGE: Modern. SIZE: 3.27m x 0.81m - 10ft.8" x 2ft.7". INDIVIDUALLY SELECTED RUGS. 100 % HANDMADE OLD KASHMIR ORIENTAL RUG HAS A FANTASTIC APPEARANCE WITH A SENSATIONAL DESIGN AND FABULOUS USE OF COLOURS. Mon – Sat 10 am – 6 pm. AGE IN YEARS. Moroccan Boucherouite Rug. 250x112cm 8'4"x3'9". The Boucherouite Rug made from old fabric on cotton foundation by tribes in Morocco. Style Tribal Boucherouite. The Rug is not perfectly rectangular or evenly straight due to being handmade. The most common uses are for a single person sized bedcover, bed throws, subsitutes of carpets even used as small bag or eating cloth. These bedspread are hand stitched by local artisan, hence would add great exotic flair to your living space. 300x200cm 10'x6'8". An Old Traditional Hand Made Indian Oriental Kilim. Very Nice Wool Piles Hand Made Indian Kilim. overall uneven faded and the kilim is coarse weave. The Kilim is not perfectly rectangular or evenly straight due to being handmade. Plain black Turkish goat hair rug, white cotton warp and short knotted white fringes. Bought in the early 1960s. Moroccan Boucherouite Rug. 142x91cm 4'9"x3'. The Boucherouite Rug made from old fabric on cotton foundation by tribes in Morocco. Style Tribal Boucherouite. MoroccanBoucherouite Rug. The Rug is not perfectly rectangular or evenly straight due to being handmade. An Old Traditional Hand Made Persian Oriental Kilim Bag. Very Nice Cotton Hand Made Persian Kilim. I believe the kilim is folded from middle and used and made as saddle bag or wheat bag . The Kilim is not perfectly rectangular or evenly straight due to being handmade. Moroccan Boucherouite Rug. 153x95cm 5'1"x3'2". The Boucherouite Rug made from old fabric on cotton foundation by tribes in Morocco. Style Tribal Boucherouite. MoroccanBoucherouite Rug. The Rug is not perfectly rectangular or evenly straight due to being handmade. This gorgeous flat weave rug is hard to find pure cotton and is from the Black Sea region of Turkey The color is pink in varying intensities with horizontal lines in the design. It is three pieces sewn together. Actual size is 7’8” x 8’9” **There is one hand sewn patch near the center of the carpet. This is indicative of a vintage piece. It is authentic and gorgeous and will not appeal to everyone. Professionally cleaned and repaired. We keep the patches intact as it adds to the storied past of each piece. Ships same business day when ordered by 9am. All returns must be within 7 days. This is a faithful modern revival of a traditional antique cotton dhurry from Rajasthan, made in Jodhpur. TYPE: hand woven. AGE: modern. SIZE: 2.47m x 1.51 - 8ft. THE RUG ATTIC. Beautiful persian flat weave cotton Handwoven carpet Kilim with beautiful flower head design nicely made ,it is called summer carpet. It is collectible and rare colour combinations. It is in good condition. It measures 292cmx180cm. FINE VINTAGE MID 20TH CENTURY TURKISH KAYSERIE ART SILK PRAYER RUG. THIS IS A VERY NICE MID 20TH CENTURY TURKISH KAYSERIE ART SILK PRAYER RUG WITH A BLUEY/GREEN GROUND COLOUR. AS IS USUAL WITH TURKISH PRAYER RUGS THE PILE IS WOVEN IN OPPOSITION TO THE DESIGN. THIS RUG REPRESENTS EXCELLENT VALUE FOR MONEY FOR ONLY £116. This is a faithful modern revival of a traditional antique cotton dhurry from Rajasthan, made in Jodhpur. THE RUG ATTIC. TYPE: hand woven. AGE: modern. SIZE: 2.71m x 1.80 - 8ft.11" x 5ft.11". (002361- for office use only). This is a faithful modern revival of a traditional antique cotton dhurry from Rajasthan, made in Jodhpur. TYPE: hand woven. AGE: modern. SIZE: 1.83m x 1.23m - 6ft x 4ft. THE RUG ATTIC. (002404 - for office use only). Moroccan Boucherouite Rug. 214x104cm 7'2"x3'6". The Boucherouite Rug made from old fabric on cotton foundation by tribes in Morocco. Style Tribal Boucherouite. The Rug is not perfectly rectangular or evenly straight due to being handmade. TYPE: hand woven. AGE: modern. SIZE: 1.79m x 1.18m - 5ft10" x 3ft10". This is a faithful modern revival of a traditional antique cotton dhurry from Rajasthan, made in Jodhpur. THE RUG ATTIC. (002403 - for office use only). Moroccan Boucherouite Rug. 155x86cm 5'2"x2'10". The Boucherouite Rug made from old fabric on cotton foundation by tribes in Morocco. Style Tribal Boucherouite. MoroccanBoucherouite Rug. The Rug is not perfectly rectangular or evenly straight due to being handmade. Moroccan Boucherouite Rug. 278x140cm 9'3"x4'8". The Boucherouite Rug made from old fabric on cotton foundation by tribes in Morocco. Style Tribal Boucherouite. MoroccanBoucherouite Rug. The Rug is not perfectly rectangular or evenly straight due to being handmade. Moroccan Boucherouite Rug. 191x125cm 6'4"x4'2". The Boucherouite Rug made from old fabric on cotton foundation by tribes in Morocco. Style Tribal Boucherouite. MoroccanBoucherouite Rug. The Rug is not perfectly rectangular or evenly straight due to being handmade. A silky soft-toned antique Turkish Panderma rug with a mihrab design. Panderma is located on the southern shore of sea of Marmara and is one of the major carpet weaving centres in Turkey. AGE: circa 1900/1920s. 189x141cm 6'4"x4'8". 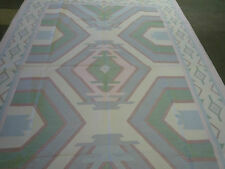 An Old Traditional Hand Made Indian Oriental Kilim. Very Nice Wool Piles Hand Made Indian Kilim. overall uneven faded and the kilim is coarse weave. The Kilim is not perfectly rectangular or evenly straight due to being handmade. Moroccan Boucherouite Rug. 160x78cm 5'4"x2'7". The Boucherouite Rug made from old fabric on cotton foundation by tribes in Morocco. Style Tribal Boucherouite. MoroccanBoucherouite Rug. The Rug is not perfectly rectangular or evenly straight due to being handmade. Moroccan Boucherouite Rug. The Boucherouite Rug made from old fabric on cotton foundation by tribes in Morocco. Style Tribal Boucherouite. The Rug is not perfectly rectangular or evenly straight due to being handmade. Moroccan Boucherouite Rug. 136x89cm 4'6"x3'. The Boucherouite Rug made from old fabric on cotton foundation by tribes in Morocco. Style Tribal Boucherouite. MoroccanBoucherouite Rug. The Rug is not perfectly rectangular or evenly straight due to being handmade. 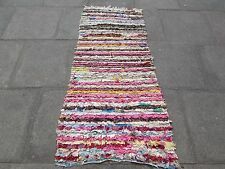 Very Nice Wool Piles Hand Made Persian Oriental Kilim. An Old Traditional HAND MADE Persian Kilim. The Kilim is not perfectly rectangular or evenly straight due to being handmade. Pile Wool Cotton. Foundation Cotton. Moroccan Boucherouite Rug. 195x80cm 6'6"x2'8". The Boucherouite Rug made from old fabric on cotton foundation by tribes in Morocco. Style Tribal Boucherouite. MoroccanBoucherouite Rug. The Rug is not perfectly rectangular or evenly straight due to being handmade. SUPERB SOFT AND FLUFFY WOOL PILED PERSIAN BALOUCH RUG. 135CM BY 80CM. SIZE EXCLUDING WOOL FRINGES BOTH ENDS. SOFT AND FLUFFY WOOLLEN PILE HAND KNOTTED ONTO WOOL FOUNDATIONS. RUGS ARE NOT JUST BOUGHT AS IS AND SOLD AS IS ! HAS OTHER BIRDS IN ITS DESIGN.DARK RED GROUND. THESE QASHQAI;S MAKE GREAT FURNISHING RUGS. RUGS ARE NOT JUST BOUGHT AS IS AND SOLD AS IS ! THIS RUG REPRESENTS EXCELLENT VALUE FOR MONEY FOR ONLY £199. 203x145cm 6'9"x4'10". An Old Traditional Hand Made Indian Oriental Kilim. Very Nice Wool Piles Hand Made Indian Kilim. overall uneven faded and the kilim is coarse weave. The Kilim is not perfectly rectangular or evenly straight due to being handmade. SUPERB SOFT AND FLUFFY WOOL PILED PERSIAN BALOUCH RUG. 133CM BY 87CM. SIZE EXCLUDING WOOL FRINGES BOTH ENDS. SOFT AND FLUFFY WOOLLEN PILE HAND KNOTTED ONTO WOOL FOUNDATIONS. RUGS ARE NOT JUST BOUGHT AS IS AND SOLD AS IS ! This is a faithful modern revival of a traditional antique cotton dhurry from Rajasthan, made in Jodhpur. TYPE: hand woven. AGE: modern. SIZE: 2.84m x 1.77 - 9ft.6" x 5ft.10". THE RUG ATTIC. (001372 - for office use only). Moroccan Boucherouite Rug. 144x78cm 4'10"x2'7". The Boucherouite Rug made from old fabric on cotton foundation by tribes in Morocco. Style Tribal Boucherouite. The Rug is not perfectly rectangular or evenly straight due to being handmade. This is a faithful modern revival of a traditional antique cotton dhurry from Rajasthan, made in Jodhpur. TYPE: hand woven. AGE: modern. SIZE: 1.49m x 0.95m - 4ft.10" x 3ft.1". THE RUG ATTIC. INDIVIDUALLY SELECTED RUGS.